Hourglass is such an original book. And I'm so glad Myra McEntire wrote and published Emerson's story. I understand why she'd think she's crazy because I would think I were crazy too if I were in her position. I don't think I'd be able to go out in public if I were her. She's so brave. Especially with what happened to her parents and what's going on. I'm surprised the thought of suicide hasn't even crossed her mind! The cover is gorgeous. 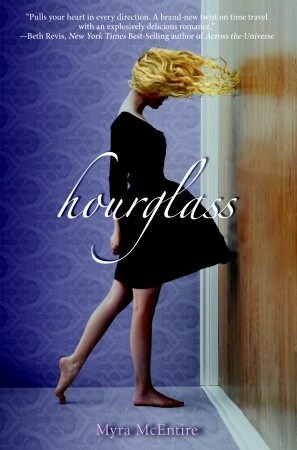 I've heard a lot of good comments about Hourglass and that made me want to read it, but I never did. The cover of the book is what actually really caught my eye and made me read it. I know, I know. Don't judge a book by its cover. I'm guilty of that crime. Kaleb is such a sweet and understanding boy - I mean man - with a I suppose similar story as Emerson. This is only because of what happened to their parents. I feel awful for them both. No one should have to feel that pain. Michael's decision makes me so mad! Why on Earth would he do that to Em?! No. HOW could he do that to her! I got that there was Kaleb but really?! I can't believe him! Of course he did it only for the better good so it's forgivable. I cried when this happened. If you have read it or will read it I think you know or will know what scene I'm talking about. Did this meet my high expectations? Yes it definitely did! It was great!